Until today I would have told you that I don’t like tofu and that it upsets my tummy. Until today, I hadn’t tried tofu in a long time, and never in a smoothie. I also haven’t tried any soy since being diagnosed with celiac. I figured it was time to taste tofu again and to see how my tummy fared with a healed GI tract. I help coordinate cooking classes at the UA that are for students, led by students. The classes are really awesome and this semester, one of the students has been particularly enthralled by tofu. He created a tofu smoothie that inspired me to try tofu again. Often people are looking for higher protein breakfast ideas that are truly satisfying. This creamy, not-super-sweet smoothie does the trick. The tofu doesn’t really impart taste to the smoothie, mostly it enhances the smoothie’s texture and mouth feel while promoting satiety. I’m big into breakfast and expect my meal to last me a while. It’s hard to make a smoothie that really lasts through the morning; the tofu and peanut butter gave this smoothie enough protein and healthy fat to last me a good three hours before feeling hungry again. 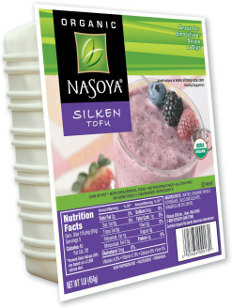 You will find silken tofu in the refrigerator section of the grocery store and it is often sold in water. Choose organic or non-GMO tofu since the majority of soybeans in the US are genetically modified. Blend until smooth, add more water as needed to thin it out to the consistency you like. This smoothie is delicious thank you for the recipe. Glad you liked it! You can mix it up with any kind of fruit you want! NourishingResults.com has plenty of healthy gift ideas!